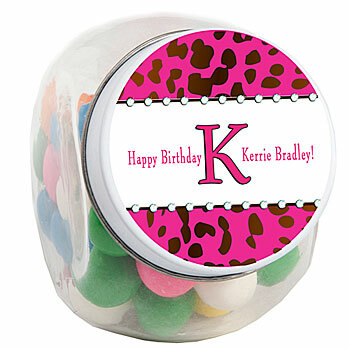 Our exclusive Ribboned Cheetah Personalized Candy Jars are a colorful way to treat your party guests! Each Ribboned Cheetah Candy Jar measures approximately 3 inches high x 2 1/2 inches wide with a 1 3/4 inch opening and are made of glass. These personalized candy jars are great for nuts, candy, and all your fun treats! Minimum order of 12.